Under-appreciated for centuries, the countertenor now storms the operatic stage. From Baroque opera to contemporary works, countertenors are familiar figures on today’s opera stages. But in fact they’re relatively recent arrivals, who have been treading the operatic boards for under a century. How did they ascend to stardom so quickly? Let’s go back to the beginning. Countertenors did figure in the occasional 17th-century stage work, including Henry Purcell’s masque The Fairy-Queen – and in fact Purcell himself was a countertenor. The 18th-century craze for castratos largely kept countertenors away from opera, though they were occasionally used as castrato substitutes, and George Frideric Handel wrote several key oratorio roles for countertenor, most famously David in Saul. But by the 1800s countertenors were limited to singing alto in cathedral choirs, with no solo prospects. So things remained until the 1940s, when Michael Tippett encouraged the talented countertenor Alfred Deller to develop a solo career. Deller’s voice so impressed Benjamin Britten that in 1960 they made history with Oberon in A Midsummer Night’s Dream, the first operatic countertenor role. During the early music revival of the 1970s countertenors attracted further attention as they began to take on Handel opera roles originally written for alto castrato, such as Giulio Cesare. And it wasn’t long before other composers followed Britten’s lead, keen to explore this new voice type’s dramatic potential. Britten realized that the countertenor’s luminous sound was ideal for portraying magical characters and gods: first Oberon and later the Voice of Apollo in Death in Venice. Harrison Birtwistle followed suit two decades on with Orpheus in The Second Mrs Kong, whose head continues to sing hauntingly after his murder. 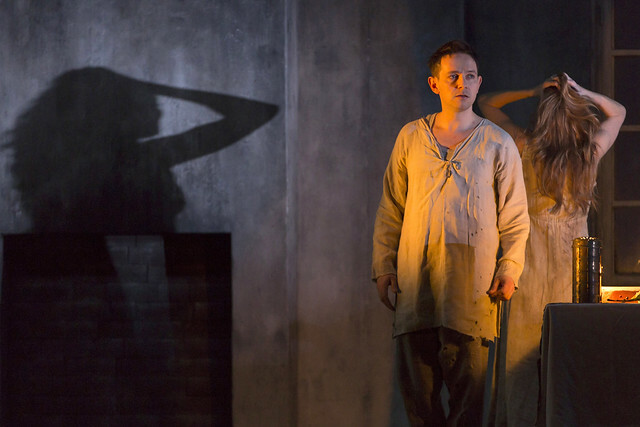 In Tobias and the Angel Jonathan Dove used the ethereal sound of the countertenor to convey the Angel’s divinity, while Philip Glass chose the countertenor to embody the semi-divine Egyptian Pharoah Akhnaten. But not all supernatural roles for this voice type are angelic: amoral Fate in Judith Weir’s Miss Fortune is made all the more sinister through his high, near-disembodied sounds. On an earthier note, composers have used the countertenor’s otherworldly vocal quality to portray a variety of animals. For Julian Philips and Will Todd, who composed the countertenor roles of Jalal the Paw (Varjak Paw) and the sardonic Cheshire Cat (Alice’s Adventures in Wonderland) respectively, this vocal type has feline qualities. Dove takes a vulpine perspective with the suavely villainous Fox in The Adventures of Pinocchio. Unsuk Chin clearly associates the high male voice with leporids, writing both the White Rabbit and the March Hare (Alice in Wonderland) for countertenor. And David Bruce gave the countertenor a regal grandeur with Hamlet the Elephant (The Firework-Maker’s Daughter) with his flamboyant trumpeting and romantic vocalises. From Deller onwards, countertenors have been unfairly mocked for sounding ‘unmanly’, and composers have on occasion exploited this to hilarious effect. Prince Go-Go’s spoilt tantrums in György Ligeti’s Le Grand Macabre are all the more amusing for their high pitch, as is Trinculo’s drunken carousing in Thomas Adès’s The Tempest, and Francisco’s ode to coffee spoons in Adès’s The Exterminating Angel (though these last two characters can be as disturbing as they are comic). Composers have also strikingly exploited the sexual ‘ambiguity’ of the countertenor voice. Peter Eötvös’s Chekhovian Three Sisters, inspired by all-male Japanese theatre, has three countertenors in the title roles, while Birtwistle illustrates the strangeness of his Snake Priestess (The Minotaur) through her high but clearly male voice. Among these angels, devils, fools and women, countertenors occasionally also get to play heroes, such as the sympathetic Edgar in Aribert Reimann’s Lear, or Dove’s Christ-like Refugee in Flight. George Benjamin’s Boy in Written on Skin is one of the most attractive of these. His pure, high voice presents him as an innocent – in stark contrast to the Protector’s angst-ridden baritone. But he is also wise and gifted beyond his years – and sensual, his voice entwining beautifully with Agnès’s. Benjamin too gives this character a touch of the otherworldly, using the countertenor’s ethereal tones to highlight the Boy’s transformation into the Angel whose words end the opera. It’s a wonderful role, and a fitting tribute to one of contemporary opera’s essential vocal ingredients. Countertenors are fashionable, but they don't blend well with other singers. I think it's to do with the physics of riding the voice on the conus elasticus, or edges only of the vocal chords. I admit that the best countertenors in the world are interesting in recitals, but at the risk of being banned from this site, and being ostracised from polite society, I think it's a case of the Emperor's New Clothes. Peter - I appreciate that the countertenor sound (if we even can talk about one sound) does not appeal to everyone but I personally genuinely love listening to many of the best countertenors singing today. .